For my family. You’re always there for me. Scarlett knows the things that go bump in the night are real. Her family has hunted demons for generations. She has grown up learning how to banish them, seeing things most people couldn’t imagine, even in their worst nightmares. In fact, hunting demons is just like many other jobs. The hours are long, the pay is nearly non-existent and the clients are determined to have their own way. Just like any other job… or at least it seemed that way before demons started hunting her. Scarlett Hunter glanced from the road to the scrawled directions her brother had given her. She frowned. Surely she should have reached the turnoff by now. Alex usually gave her clear directions, but she guessed he’d been in a hurry. She looked in the rear view mirror and seeing no one about, slowed down. This better not take too long. She didn’t want to be stuck driving back into Brisbane during peak hour traffic. She wasn’t certain how she’d been talked into doing Alex’s job. She only hoped Mrs Rose, the woman whose house she was looking for, wasn’t in tears. She never knew how to comfort grieving people. They made her feel awkward. Give her a sword and a demon to face any day. Scarlett glanced at the directions again and ran the fingers of one hand through her short blond hair that feathered around her face. With a shake of her head she stared at the deserted road. For all she knew, she was lost. Her cousin Riley would probably say she’d subconsciously gotten lost to get out of the job. She’d argue that comment. Anyone would’ve gotten lost with the directions she’d been given. Scarlett checked the rear view mirror again, wondering if she should turn around and have another look in case she’d missed the turnoff. No, she’d drive a little further before doing that. She felt a tingle at her left wrist as a pop, more physical then audible, filled the car. Movement drew her eyes towards the passenger seat. Her breath caught in her throat, her body tensed and her mind whirled with a thousand questions as she tried to keep her attention on the road. A young man now sat in the seat. He had light brown skin, dark wavy hair and eyes that could only be called black. And so beautiful it took all of her willpower to keep her eyes on the road. “What-” Scarlett began. No. She wouldn’t start talking to one of them. That wasn’t what she’d been taught. Her jaw tightened on all the questions that wanted to spill forth. Seeing a safe spot, she pulled over to the side of the road and turned the car off. As she jumped out, she tugged on the boot lever, pocketing her car keys. 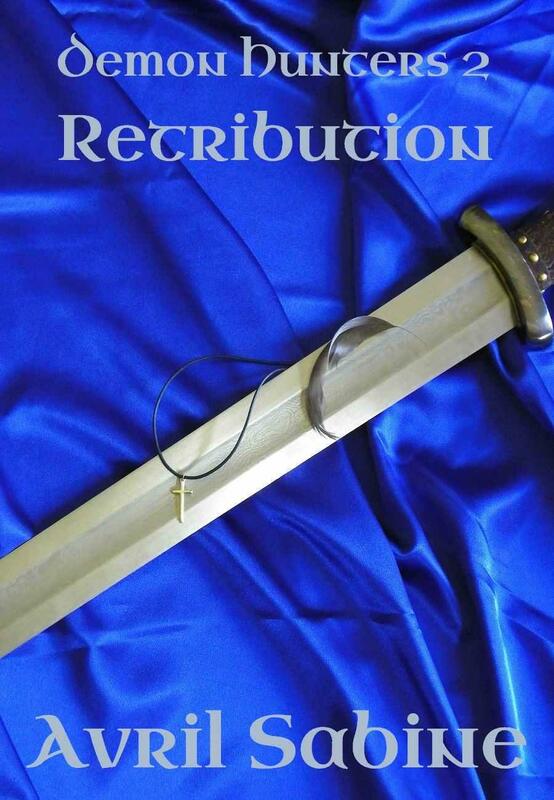 Without a glance at her passenger she ran to the boot and pulled out a sword, unsheathing it. Spinning around, she found the young man in front of her. She hadn’t heard the door open, but that didn’t surprise her. Holding the sword up, she took a step forward. The man held his ground. No surprise there, either. “What do you want?” Scarlett met the dark eyes, distrust in her voice. Now that was a surprise. Scarlett frowned. Maybe her assumption had been wrong. But what else could he be? “What are you?” Her words were cautious. “You’re well known among my kind. I have a brother who talks of you often.” He glanced at the narrow black line, with a hint of red in it, which snaked around her wrist. The line started at her pulse point in the middle of her wrist and travelled two and half times around her wrist to where it ended suddenly. A demon mark. It lengthened every time she sent a demon home. “Then maybe your brother should stay in hell where he belongs.” She knew demons didn’t have the same meaning for brother as humans did. They were an ally or what passed for a friend amongst demons. “All major sins start with minor ones. Each step is that much closer than the last.” Life would be much simpler if she could send demons to hell the moment she saw them. But the demons had to be causing harm or intending to. So far this demon was all talk, but with demons talk could be more dangerous than physical harm. “My sin is not violence. It’s lust.” He leered at her to drive his point home. Scarlett almost laughed. His antics reminding her of her cousin Riley. She caught herself in time. It was never a good idea to lower your defences around a demon. She glared at him. “What do you want, demon?” She stressed the last word to remind herself what it was she spoke to. “Go away demon. I don’t have time to stand here and talk in circles with you.” Scarlett sheathed her sword and walked to the driver’s side door, an eye on the demon the entire time. He hadn’t done anything wrong yet, but that didn’t make him trustworthy. The moment she opened her door, he disappeared, reappearing in the passenger seat again. She sighed in frustration. Standing with her door open, she stared at the demon. He stared back, an unfathomable expression on his face. “What?” Her heart leapt. She took a deep breath, reminding herself to remain calm. It should have been Alex on this lonely road, not her. “It’d help if you didn’t talk in riddles and half sentences. Who will call you to kill me and why do you know about it when it hasn’t happened? And you said doom. That doesn’t have to mean death. Speak plainly, demon.” Scarlett ran her fingers through her short hair, taking a deep breath. Patience, she reminded herself. And caution. The name echoed inside Scarlett’s head and she shakily sat in the driver’s seat. Retribution! She tucked her sword under the dash so the hilt rested on her seat and pulled out her phone. No coverage. She dropped it in her lap and leaned her head on the steering wheel, the demon beside her forgotten. Scarlett frowned and looked at him. “What?” It was hard to focus on what he said when the word ‘doom’ echoed in her mind. Doom and Retribution. Not a good combination. She forced herself to concentrate. You had to watch every little thing you said around a demon and every word they spoke or you’d end up in trouble. “I don’t have time to sit here and listen to your rubbish.” She pushed the key into the ignition and turned it. As soon as she sorted out Mrs Rose’s problem she’d go home to Gran. Hopefully she’d know what to do. She glanced at Alex’s map and frowned. Where was the turn off? Scarlett’s lips pressed tight together. She buckled her seatbelt, slid her phone into her pocket, checked her mirrors and pulled onto the empty road. Five kilometres later she turned onto a rutted dirt road. She drove slowly and watched for the large red mailbox she’d been told sat by the driveway. And there it was, about four hundred metres along on her right. She pulled up in front of the old timber cottage that was badly in need of paint. It had a verandah across the front, slightly sagging on one end. To one side of the door was a pile of boxes and on the other were two cane chairs with a wrought iron table between them. “I’m no fool. Give a hunter my true name? You may call me Desire.” He smiled as she continued to glare at him. “You’re a demon. Don’t expect me to feel sympathy for you.” Scarlett opened the car door and her hand hovered over her sword. She couldn’t take it with her even though every instinct screamed at her to remain armed. Her fingers curled into a fist and she turned away, closing the door with her other hand before she strode to the verandah. The demon walked beside her. She refused to acknowledge him and instead knocked on the front door.